The Club often runs taster sessions before its beginners courses for people who wish to try out the sport before signing up for the full five-week course. Beginners courses usually start in September, January and May every year with one or two taster sessions in the weeks before. See below for the date(s) of the next taster sessions and how to sign up. Our beginners courses last for five weeks and are designed to teach new fencers the basic techniques of foil fencing, the rules of the sport and, most importantly, how to fence safely. After the five week introduction, fencers may continue for a further five weeks training before taking the test for the British Fencing Association (BFA) Foil Achievement Award Level 1, a qualification recognised by all British fencing organisations. Simply enter your details in the form below and select whether you wish to take part in the taster session or the five-week beginners course (or both!). The fees of £7.00 (or £5.00 with student discount) or £35.00 are then payable by credit card, debit card or Paypal account through the Paypal system. Please note that if you wish to join both the Taster Session and the Beginners Course, you will need to enter your details twice and pay the fees separately. If more than one person is signing up, please note that separate inputs will need to be made for each individual. Minimun age: 12 years old. The fee for Taster sessions is £7.00 with a concessionary rate of £5.00 for students, which is payable at the start of the session. Beginners courses cost £35.00 for five weeks coaching, which is payable in full at the start of the first session. What do the taster sessions and beginners courses include? The minimum age for participants is 12 years and all fencers aged under 18 years must be accompanied by a parent or other responsible adult to comply with our Child Protection Policy. There is no upper age limit! There is a maximum of 14 fencers on all sessions. Fencers should wear trainers with light-coloured soles that will not mark the gym floor. They should also wear tough, loose-fitting trousers such as jeans or tracksuit bottoms that will allow them to stretch. 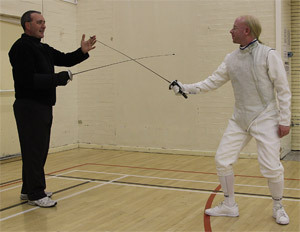 Pockets on trousers should be zipped up or taped over while fencing to prevent them catching blades.